StadiumBound is at Camelback Ranch and shares a video of the boys heading to practice yesterday. 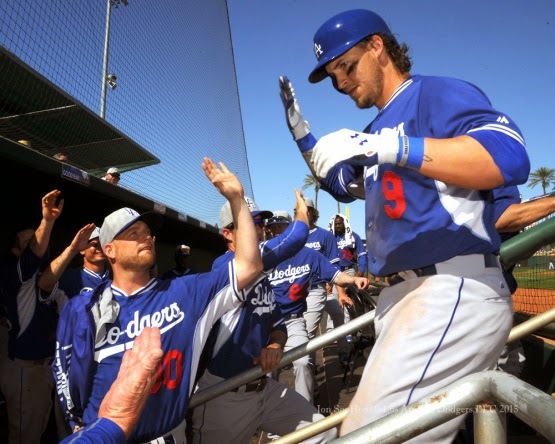 @DaaDozer at West Coast Bias Dodgers provides some sights and sounds of spring. 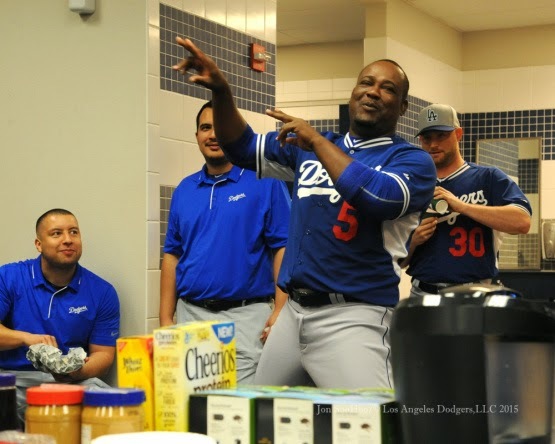 Watch the Dodger work out on the field without the interruption of any commentary. Steven Kaufman captures Yasiel Puig taking some batting practice during spring training as Jimmy Rollins does a little bit of trash talking. Puig responded back with, "OK, Jimmy!" BJ Kileen does the "Ball Walk" around Camelback Ranch. Check out some of the new features added to the Dodger spring home. HOME COOKING: The Dodgers are back home this afternoon to take on the Milwaukee Brewers for the second and final time this spring. 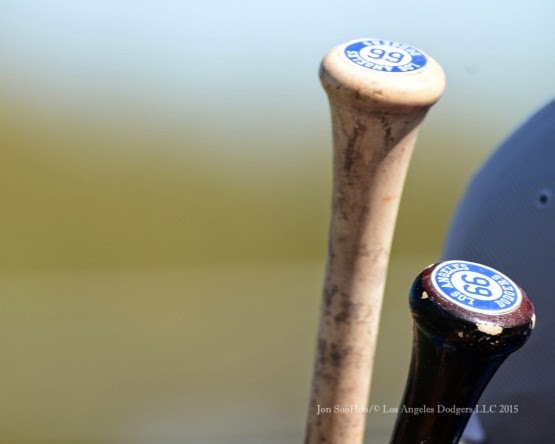 A split-squad of Dodgers crushed the Brewers, 10-1, on Friday in Maryvale. Last season, Los Angeles lost five of its six games with Milwaukee, including a late-season sweep Aug. 15-17 at Dodger Stadium. This year, the “Brew Crew” will play host to the Dodgers seven times, including four contests in Milwaukee May 4-7. The Dodgers host the Brewers for three games July 10-12, their final games before the All-Star break. NOT THAT COOL: Los Angeles gave up four runs in the ninth inning yesterday and then salvaged a 5-5 tie with the Cleveland Indians in Goodyear. The big performance of the day was from newly-acquired catcher Yasmani Grandal, who went 3-for-3 with a solo homer and three RBI on the day. Until the ninth, the Dodger relievers were solid behind starter Mike Bolsinger, as Chad Gaudin (2.0 IP), Jeremy Horst (1.1) and Chin-hui Tsao (2.2) all tossed scoreless baseball. Through five games, the Dodgers have a .294 team batting average, a .354 on-base percentage and a .469 slugging percentage. A couple Dodgers in the starting lineup this afternoon have been on fire, namely center fielder Joc Pederson (5-for-7 with two doubles and four runs scored) and designated hitter Scott Schebler (5-for-10, three doubles, two RBI). ON THE MOUND: Right-hander Brandon McCarthy, signed by the club to a four-year deal in the offseason, will make his Dodger debut this afternoon vs. Milwaukee. McCarthy is coming off a career year last season with the Yankees and Diamondbacks in which he established career highs in innings (200.0), wins (10) and strikeouts (175). After being acquired by the Yankees on July 6, the Glendale, CA, native went 7-5 with a 2.89 ERA in 14 starts with New York. In 207 games (153 starts) for the White Sox (2005-6), Rangers (2007-9), A’s (2011-12), Diamondbacks (2013-14) and Yankees (2014), McCarthy is 52-65 with a 4.09 ERA in nine big league seasons. Left-handed relievers Daniel Coulombe and Ryan Buchter are both expected back on the mound after each fired a scoreless inning on Thursday against the White Sox. Coulombe appeared in five games for the Dodgers last year, posting a 4.15 ERA. In his three years in the minors, Coulombe has gone 7-3 with eight saves and posted a 3.43 ERA in 126 games. Buchter made his Major League debut with Atlanta last season, which was his only big league appearance. In nine minor league seasons he has posted a 32-18 record with a 3.44 ERA in 327 games (two starts) in the Nationals (2006-08), Cubs (2009-11) and Braves (2011-14) organizations. RHP Juan Nicasio is looking to bounce back from a rough first-time out in 2015. The right-hander allowed three runs on four hits in his 1.0 inning of work in the Cactus League lid-lifter Wednesday. Three right-handers that impressed in their Dodger debuts and are expected to see action today are Sergio Santos, Adam Liberatore and Josh Ravin. The trio each tossed a scoreless inning on March 4 vs. the White Sox. Santos, a former first-round pick of the D-backs in 2002, spent the last three seasons with the Blue Jays and is a converted shortstop. The 27-year-old Liberatore was acquired in a trade with the Rays on Nov. 20, 2014, which also brought RHP Joel Peralta to Los Angeles, and had a career year for Triple-A Durham last year, going 6-1 with four saves and a 1.66 ERA in 54 games. Ravin, a graduate of Chatsworth High School, is in his second season in the Dodger organization after combining to go 2-1 with six saves and a 3.55 ERA in 23 relief appearances for Double-A Chattanooga and Triple-A Albuquerque last year. WHO’S GOT NEXT? : The Dodgers will have seven minor leaguers joining the club today against the Brewers at Camelback: infielders Jarek Cunningham (No. 87) and Luis Mateo (No. 86); outfielder Joey Curletta (No. 95); catcher Ryan Scott (No. 88); RHP Steve Smith (No. 94), LHP Mike Thomas (No. 89) and RHP Jeremy Kehrt (No. 85).